Oh, those ugly tear stains, especially noticeable in white dogs. Tear stains develop when a dog’s tears accumulate on their fur providing the perfect breeding ground for bacteria and yeast to grow. As a result, the hair underneath their eyes appears stained. Most veterinarians agree that face staining results from excessive tearing. The causes of excessive tearing include but not limited to genetics, health, diet, fleas, bacterial infection, ear infections, cutting teeth (in puppies), irritation, high mineral content in the dog’s drinking water, blocked tear ducts, etc. Since there is no one cause of tear stains, so there is no one cure. What works for some may not work for all. So, what exactly causes grooming nightmares? Tear stains are usually caused by molecules called porphyrins. Porphyrins are produced when the body breaks down red blood cells. Porphyrins are excreted mainly through bile and the intestinal tract, but in dogs a substantial amount of porphyrin is excreted through tears, saliva and also urine. This is why you might see staining on hair other than just below the eyes. This is also why dog sometimes have discolored hair if they have a habit of licking themselves excessively. When these porphyrin molecules remain on a white coat for any length of time, stains result. This happens in dark coated dogs, but you cannot see the stains. Stains often darken in the presence of sunlight creating an unsightly red mess. When the area around the eyes and mouth are chronically wet and moist, a red-yeast infection can develop. This is different from the red stains that are produced by the combination of tears and prophyrins. Low grade bacterial infections in the tear ducts are also a culprit. The Causes fall into three main categories: Environmental, Medical, and Genetic. High mineral content in your dog’s drinking water is thought by some to contribute to staining problems. If you happen to see staining around the dog’s mouth as well as eyes, this could be the problem. Ask your veterinarian for more information. Some may recommend serving distilled or filtered water to reduce tear staining. Sometimes teaching the dog to drink through a water bottle helps a little. Sometimes the tearing lessens when you switch to a high quality diet. Some suggest that the dyes in dog food contribute to the problem. If your dog is not eating a premium diet, switching now might help. Some people prefer homemade or raw diets, and others are concerned about nutrient balance created when feeding a strictly homemade diet. Most veterinarians recommend a well-researched commercial diet of some kind, from a major manufacturer. Some dog owners discover that feeding their animals a dry kibble with no preservative, fillers or additives will boost their resistance to inflammatory reactions and thus reduce tear staining. Another environmental factor that is commonly blamed for tear staining in dogs is allergies. Dogs can suffer from seasonal allergies and irritants like pollen just as humans. Your dog may also have allergies to dust or other similar allergens that irritate the eyes, causing the dog’s eyes to tear. Smoking around your dog may also irritate his eyes causing them to tear excessively. Young puppies that are teething produce more tears and are also prone to tear staining. In this case, as the dog matures, the problems go away. Some dogs have clogged tear ducts, which need to be irrigated by a vet. 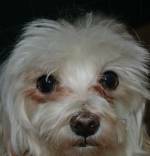 An evaluation made by an ophthalmologist veterinary concluded that up to 20% of small dogs, such as Maltese, Bichon Frisé, Poodles, Cockers and Terriers, may have this dysfunction of their lachrymal glands (tear ducts) requiring them to be surgically corrected. Blocked tear ducts typically have no bearing on preventing or causing staining or ocular discharge, but they should be monitored for the health of your dog. Some dogs are super sensitive to water getting in their ears during bath time. These dogs require extra care to make sure the ears are dry after the bath. Many long haired dogs also have hair that continues to grow inside the ear and if not removed can lead to infection. Ear Infections may be a cause of staining. Excess hair can be pulled from the ear using your fingertips, tweezers or a hemostat. Caring for your dog's ears is something you can learn to do yourself. If this is not something you feel comfortable doing, be sure that your grooming does it regularly. Some dogs produce excessive tears often the result of the human intervention of breeding. This is particularly common in those breeds that were selectively bred to create short snouts and protruding eyes causing abnormally narrow tear ducts. Breeds such as Shih Tzu, Maltese, Bichon and Pekinese are especially vulnerable to these problems. Light colored poodles also seem to be predestined to staining. Some dogs are genetically predisposed to excessive tearing. Dog genetics will also determine the dog’s coat type. A dog with long hair can experience eye irritation from long hair on the face that comes in contact with the eyes, leading to tearing and ultimately, tear staining. Dog breeds with bulging “bug” eyes, like the Shih Tzu and Pug, are also prone to excessive tearing, as the eyes are more exposed and therefore, more prone to irritation. There are two basic approaches to treatment, internal and external. Internal treatment consists of ingesting a substance or medication that will either cure a bacterial infection or change the ph of the tears. External treatments include all those measures that one takes to remove the stains around the eyes. Some are more beneficial than others and some can be considered dangerous. There are as many homemade treatments as there are products on the market swearing to cure your dog of those unsightly stains. Some work better than others and some don’t really seem to make much difference, even though people swear by them. Here is a list of treatments that have been mildly to highly successful in removing stains. 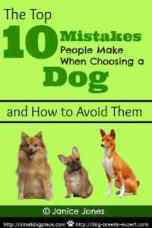 The best way to find out which will work for your dog is to try each for a specified period of time. Some methods can be combined with others to improve the odds of removing stains. Serve your dog distilled, filtered, or bottled water only out of a stainless steel or ceramic bowl. Do not use plastic as they tend to wear down creating an environment where bacteria can thrive. Switch to a high quality dog food. If you can purchase the food at your local grocery store, then you are probably not serving a high quality food. Mix a teaspoon of apple cider vinegar with your dog's water each day. This increases the pH of the water, which helps combat the growth of microorganisms that make the tear stain problem worse. The bacteria that exacerbate tear stains aren't particularly dangerous, but they do cause the stained fur to emit a foul odor. Moisten a clean cloth or cotton ball with room temperature, or slightly warmer, water. You can also use a weak saline solution or lemon juice mixture instead of water. Wring the cloth out before wiping your dog's eyes. Hold your dog's head still and gently wipe the stained area around his eyes. Avoid the eye itself, as saline and lemon solutions can sting your pet's eyes. Do this at least two times per day. Clean around the eyes with contact lens cleaning solution containing dilute boric acid. The boric acid will oxidize the iron in the porphyrins and lighten the stains. To clip or not to clip, that is the question. If you are concerned that there may be some abnormalities with eye lashes, is it better to let them grow long or leave them shaved close to the skin? This is a matter of some debate among breeders. If you have a breed with long lashes, examine them closely to see the direction the eyelashes are going--pointing inward towards the eye or outwards. If you choose to leave the hair, allow it to grow out and pull it back so the hair does not get in the eyes. If you choose to clip, keep it clipped short all the time. Eye lashes that begin to grow out are the most problematic, so it is best to decide which method will work best for you and stick with it. Boric Acid Powder: Rub it into the staining with fingers and leave it there. Do NOT brush it out; it is left in the coat. Do this every day, also use a very fine comb such as a flea comb to comb out any debris in the corners of the eye. Also, remove any hair in the corners of the eyes. BREEDERS: Do NOT put it on puppies if the mother licks them clean. Mix equal amounts of milk of magnesia and hydrogen peroxide in a bowl, then stir in small amounts of cornstarch until the solution becomes a paste. The solution should be thick enough so that it does not run or drip. Apply the solution to the stained fur around your dog's eyes with your hands, an old toothbrush or make-up brush. Rub and massage it into the fur, so that it coats the hair all the way to the roots. Let the paste dry for several hours, then rinse it out with warm water or wipe it with a wet cloth. Tearplex™ is a relatively new product formulated with 100% natural ingredients, and does not contain risky chemicals such as Tylosin. Tylosin is an antibiotic that is given daily to reduce tear stains. The problem with tylosin is that an indefinite daily dose of antibiotics can prevent your dog from benefiting from antibiotics, should he ever need them. The product contains Billberry Extract, Eyebright, Gluthathione and Taurine, an amino acid. The product will reduce the tear stains and then as the new hair grows out, you will see a difference in appearance. Billberry Extract is a herbal remedy for eyesight and eye problems in humans. According to WebMD, Eyebright is used to treat a wide range of problems including allergies, sinuses, cancer, coughs, conjunctivitis, ear aches among others. Gluthathione is a powerful antioxidant with a wide range of treatment options. Other commercially available eye stain removal product such include Eye Envy is a two-step process. The product contains a cleanser, an astringent, an herbal antibiotic and an antibacterial. The products do not contain bleach or peroxides and will not cause discoloration. 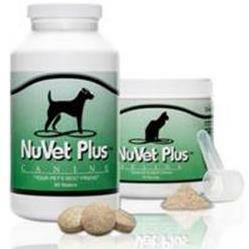 This product can be used on puppies over 8 weeks and all dog breeds. Discuss medications with your veterinarian. If bacterial and yeast infections are involved you need to take steps to reduce and eliminate their presence. Veterinarians can prescribe medication to treat bacterial and yeast infections. Your veterinarian or eye specialist veterinarians can determine if excessive tearing is the source of stains, and describe alternatives available. Tetracycline is often prescribed with some success, but it should never be given to puppies. Remember, if you want success in removing tear stains, you must first determine what is causing them.